October 6th, Eden Valley, Clinton County Iowa. September 1st, Maquoketa Caves, Jackson County Iowa. August 11th, Pinicon Ridge Park, Linn County Iowa. June 23rd, Indian Creek Nature Center, Linn County Iowa. June 2nd, Pin Oak Nature Center, Lucas County Iowa. October 14th, Fox Forest near Diamond Park, Poweshiek County Iowa. October 7th, Palisades-Kepler Park, Linn County Iowa. September 16th, Rodgers Park, Benton County Iowa. September 9th, Wildcat Den State Park, Muscatine County Iowa. August 26th, Browns Woods, Polk County Iowa. July 22nd, Squire Point, Johnson County Iowa. June 10th, Lake Macbride Park, Johnson County Iowa. May 6th, Wickiup Hill, Linn County Iowa. October 22nd, Ryersons Woods, Johnson County Iowa. October 15th, Wickiup, Linn County Iowa. October 10th, Palisades-Kepler, Linn County Iowa. September 24th, Amana, Iowa County Iowa. September 10th, Ashton-Wildwood Park, Jasper County Iowa. September 3rd, Big Grove, Johnson County Iowa. August 13th, Starr's Cave, Burlington Iowa. July 16th, Shell Rock Bend near Shell Rock Iowa. June 25th, Ledges State Park near Boone Iowa. June 4th, Amana Nature Trail in Iowa Co. Iowa. October 17th, Rodgers Park in Benton Co. Iowa. September 12th, Linder Point, Johnson Co. Iowa. Note that this was not an official foray. September 5th, Central Park, Jones Co. Iowa. July 11th, Prairie Creek, Jackson Co. Iowa. July 4th, Amana Woods, Iowa Co. Iowa. June 20th, Ryersons Woods, Johnson Co. Iowa. May 10th, Palisades Kepler, Linn Co. Iowa. October 18th, Grimes Farm, Marshall Co. Iowa. September 13th, Palisades Kepler, Linn Co. Iowa. August 9th, Cou Falls, Johnson Co. Iowa. June 29th, Wapsipinicon Park, Jones Co. Iowa. June 7th, Ryerson's Woods, Johnson Co. Iowa. May 10th, McNeil Preserve, Jackson Co. Iowa. May 3rd, Wickiup Hills Natural Area, Linn Co. Iowa. November 2nd, Wickiup Hills Outdoor Learning Area, Linn Co. Iowa. October 20th, Pinicon Ridge Park, Linn Co. Iowa. Note, this was just Roger and Glen on this outing. October 12th, Jefferson County Park, Jefferson Co. Iowa. September 27th, Amana Nature Trail, Iowa Co. Iowa. August 3rd, Ryersons Woods, Johnson Co. Iowa. July 20th, Wapsipinicon Park, Jones Co. Iowa. June 22nd, Ashton Wildwood Park, Jasper Co. Iowa. June 9th, Squire Point Park, Johnson Co. Iowa. May 25th, Pinicon Alders Park, Mitchell Co. Iowa. April 20th, Oakland Mills Park, Henry Co. Iowa. October 21st, Lake Macbride State Park, Johnson Co. Iowa. October 6th, F. W. Kent Park, Johnson Co. Iowa. September 15, Snyder Farm, Polk Co. Iowa. September 9th, Oakland Mills Park, Henry Co. Iowa. August 18th, Hunt Woods Park, Des Moines Co. Iowa. July 21st, Wapsipinicon State Park, Jones Co. Iowa. June 30th, Cardinal Marsh, Winneshiek Co. Iowa. June 16th, Brushy Creek Recreation Area, Webster Co. Iowa. June 2nd, Amana Nature Trail, Iowa Co. Iowa. April 28th, Dragon Nest farm in Cedar Co. Iowa. Here is a spreadsheet of the fungi that were identified with reasonable certainty from 2003-2011 on PSMC forays. Note this is an XLS spreadsheet. Here is a spreadsheet of the fungi that were identified with reasonable certainty in 2011 on our forays. Hyperlinks have been added and a few of the names updated. Single click on the species and a page will be launched with that species featured. Note this is an XLS spreadsheet. Here are the species list from 4 forays in November 2011. 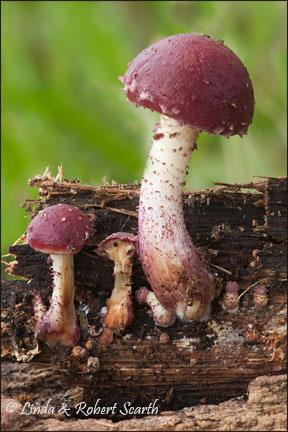 Only Roger and Glen were present at these forays, however, about 30 species of fungi was found each time. November 25th, Dudgeon Lake, Benton Co. Iowa. November 19th, Lake MacBride State Park, Johnson Co. Iowa. November 12th, Wapsipinicon State Park, Jones Co. Iowa. November 5th, Wickiup Hill Natural Area, Linn Co. Iowa. October 1st, Wickiup Learning Center, Linn Co. Iowa. Sept 24th, Pioneer Ridge, Wapello Co. Iowa. Sept 10th, Maquoketa Caves State Park, Jackson Co. Iowa. Aug 6th, Sherman Park, Clinton Co. Iowa. July 23th, Pinicon Ridge Park, Linn Co. Iowa. July 9th, Amana Nature Trail, Iowa Co. Iowa. June 11th, Brushy Creek, Webster Co. Iowa. May 8th, Squire Point, Johnson Co. Iowa. April 30th, Palisades Kepler Park, Linn Co. Iowa. Here is a spreadsheet of the fungi that were identified with reasonable certainty in 2010 on our forays. Hyperlinks have been added and a few of the names updated. Single click on the species and a page will be launched with that species featured. Note this is an XLS spreadsheet. The remainder of the lists are all .pdf format. October 16th, Wickiup Hill, Linn Co. Iowa. October 2nd, Ashton Wildwood Park, Jasper Co. Iowa. September 26th, Palisades Kepler Park, Linn Co. Iowa. September 18th, Brown's Farm, Jackson Co. Iowa. August 21st, Eden Valley Park, Clinton Co. Iowa. July 25th, Pinicon Ridge Park, Linn Co. Iowa. June 27th, Amana Nature Trail, Iowa Co. Iowa. June 12th, Brushy Creek Recreation Area, Webster Co. Iowa. May 29th, Macbride State Park, Johnson Co. Iowa. May 8th, Shimek State Forest, Lee Co. Iowa. May 1st, Palisades Kepler Park, Linn Co. Iowa. November 14th, Pinicon Ridge Park near Central City Iowa. November 1st, Macbride State Park near Solon Iowa. September 26th, Wickiup Hill, Linn Co. Iowa. September 12th, Palisades Kepler Park, Linn Co. Iowa. October 4th, Browns and Walnut woods near DesMoines. July 12th, Wickiup Hill near Cedar Rapids. May 18, 2008 Pinicon Ridge Park near Central City.